President Obama and Mitt Romney haven't even had their first debate yet, but before the third one is over, many voters will have already cast their ballots. In 32 states and the District of Columbia, any qualified voter may vote during a designated period prior to Election Day, without an excuse or justification. Several states, including North Carolina, New Hampshire, Virginia and Wisconsin, have already begun mail-in absentee voting. Iowa will allow it beginning on Thursday, while Ohio will do so the following Tuesday, Oct. 2, the Hill reports. That means the candidates could deliver the best debate performances of their careers and it would be too late to sway the votes of a growing slice of the electorate. Although it brings additional logistical hurdles, early balloting benefits campaigns organized enough to take advantage of it because resources can be more finely targeted at the remaining voters the weekend before the election. "This allows them to bank votes," said Michael McDonald, a professor at George Mason University in Fairfax, Virginia, who studies early voting. 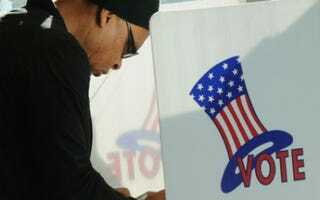 "They encourage their supporters to vote early and scratch out the names of people who have voted. Once they turn that ballot in, they’re not going to contact them anymore." In other words, if you know who you want to vote for and don't anticipate being swayed by debates or last-minute television ads, the best thing you can do for your candidate might be to get a ballot in ASAP, thereby freeing up the resources the campaign would have used to contact you in the weeks leading up to the election, and use that day for something else — like dragging everyone else you know to the polls. Read more at the Hill and Bloomberg.